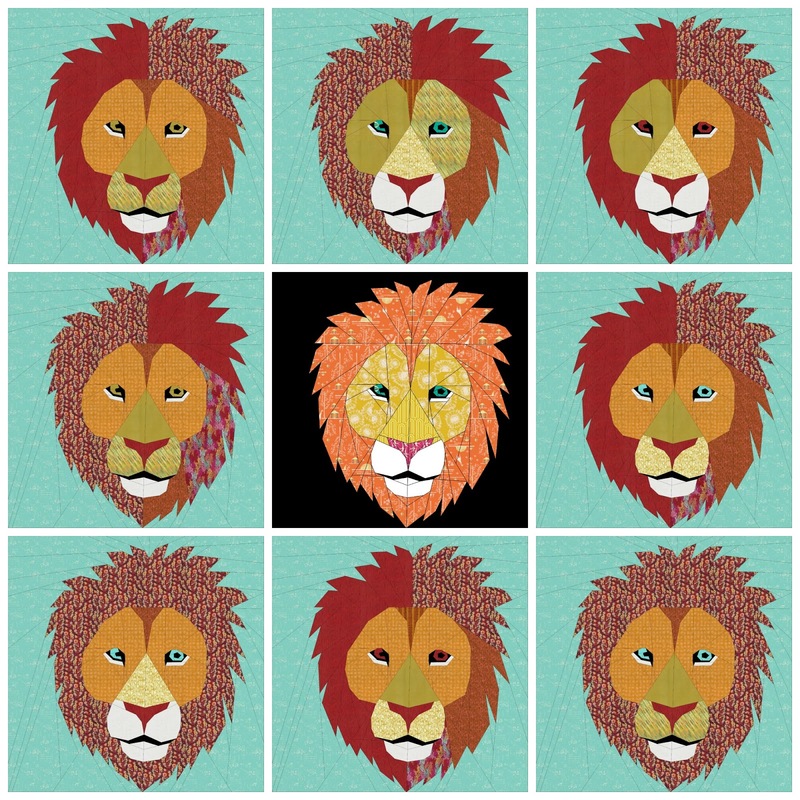 When I first designed my lion pattern, Marsala had not long been chosen as the Pantone colour of the year and the 2015 Pantone Quilt Challenge had just been announced. Now I must admit that I don't generally tend to enter these kind of challenges as they never seem to coincide with the projects that I am working on, but it suddenly occurred to me that a marsala mane would look amazing on this paper pieced design. I tried to ignore the idea, and worked on other projects, but the marsala lion kept on haunting me. Late one night (isn't that always the way with online fabric shopping!?!) I sat down to order fabrics. I don't know how other people experienced it, but I found it really difficult to choose fabrics in the right shade based on the images on my computer screen. This difficulty was compounded by the fact that many of the fabrics that I KNEW were marsala had very straight geometric designs and would not have been suitable for my lion. Other fabrics with more fluid designs were difficult to judge as to whether they were more red, brown or marsala. 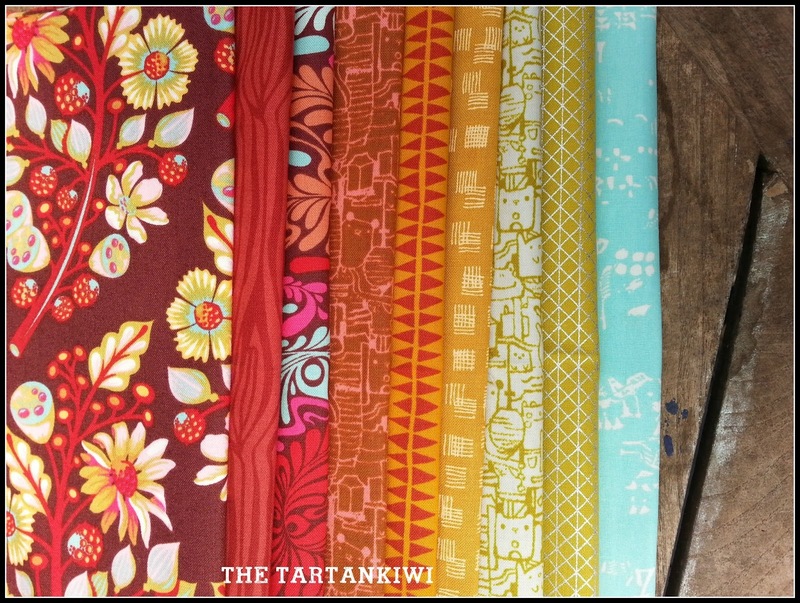 I bought a range of fabrics in roughly the colours that I wanted, knowing that I would probably change my mind with regards to placement and exact use of the fabrics when I saw them in person. In the end, I suspect that some of my fabrics were more red than marsala, but they work well within my design and that was my top priority. The fabrics that I used were a mixture of Tula Pink's Moonshine, Carolyn Friedlander's Doe, various Cotton and Steel prints and Katrina Roccella's Skopelos. I love the way that the fabrics work together. 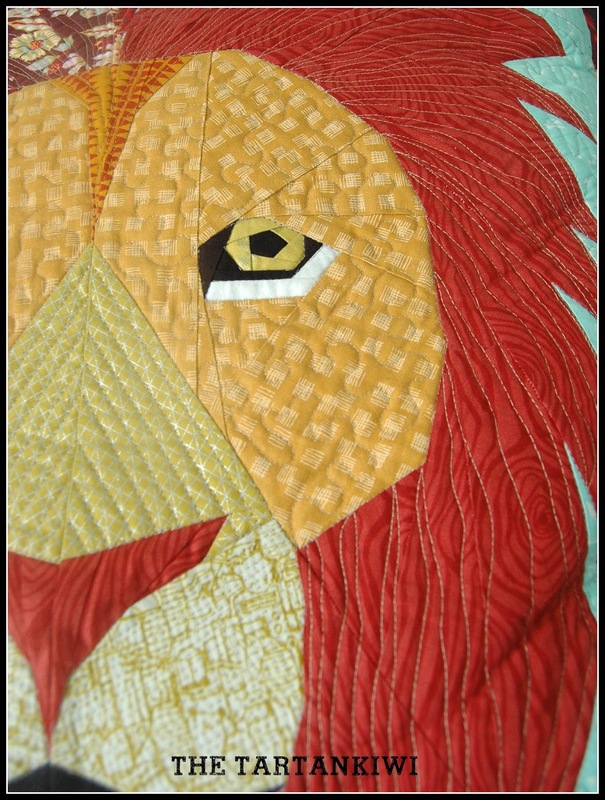 When deciding which fabrics to put where, I was inspired by Patti of Retired to Quilt's interpretation of my lion pattern. I loved the way that she shaded the lion but didn't want my lion to be an exact copy of hers. I wanted to make a lion that was completely different to my first interpretation of the pattern. I don't like to sew the same thing too many times, so when I do, I like to change things up and try new things. When the pattern is one of my own, it has the added benefit of showing the versatility of my patterns. There was one slight technical hitch in the making of this cushion. It was commissioned by my 4 year old son who, the moment that he saw a picture of my lion design had said "I want you to make one of them for me!" 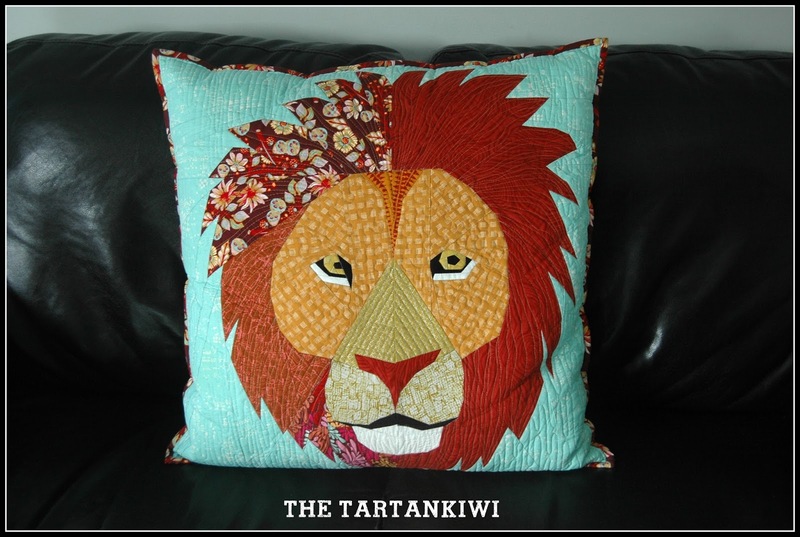 After seeing my Utopian Lion cushion he added a few conditions- I want it to have a pink nose like this one and a black mouth. Call me a naughty mummy, but I ignored the request for a pink nose and when my son saw the finished lion block he said "Nooooo! I want you to make another one for me with a pink nose!" Luckily my hysterical laughter must have given away the fact that there was no chance that I was making another lion and he pretty quickly accepted the marsala nose instead! I've had the feeling for a while that my basting has been the weak link in my quilting. This cushion was the first time that I have tried spray basting. I am really really happy with the result and I will definitely be doing it again for small projects (I don't know if I'm brave enough to do it on bigger quilts). 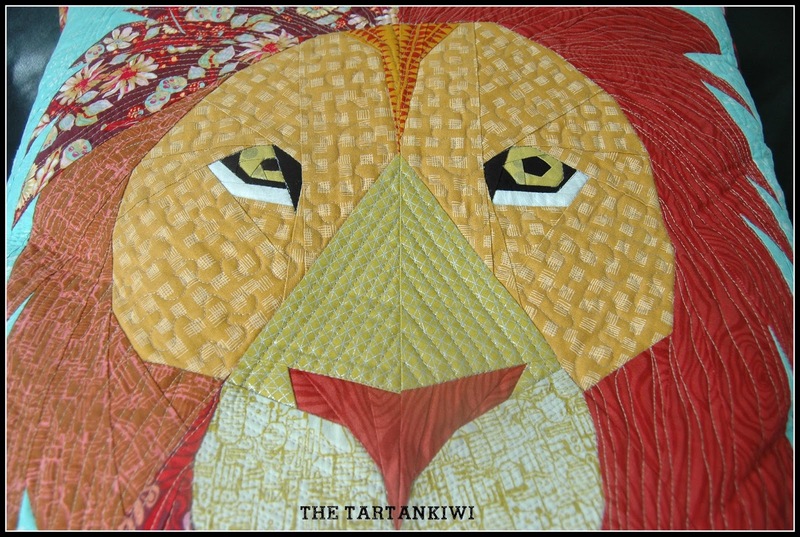 I free motion quilted using 50 weight Aurifil 2000 for the lion and 50 weight Aurifil 2600 for the background. I am definitely becoming more confident in my quilting and am loving the extra detail that free motion quilting adds to my patterns. I am finding that free motion quilting can be used to soften the straight lines of a paper pieced design. This is illustrated in the mane. I had plans to increase the size of my paw print pattern and use it as the back of the cushion, but my wee man requested a "fluffy back". Having ignored the pink nose request, I didn't feel that I could ignore the minky request, so I chose some navy minky with white polka dots. I am really glad that I decided to bind the edges of the cushion. I love the way that it frames the lion and makes it look finished. He LOVES his new cushion! When I handed it over there was a flurry of screams while he ran about throwing the cushion on the floor and himself ontop of it. As for me, well as is often the case with such things, it is my new favourite cushion. I love the way that he seems to be watching no matter where you sit in the room. He is really striking and keeps drawing my eye back to him. 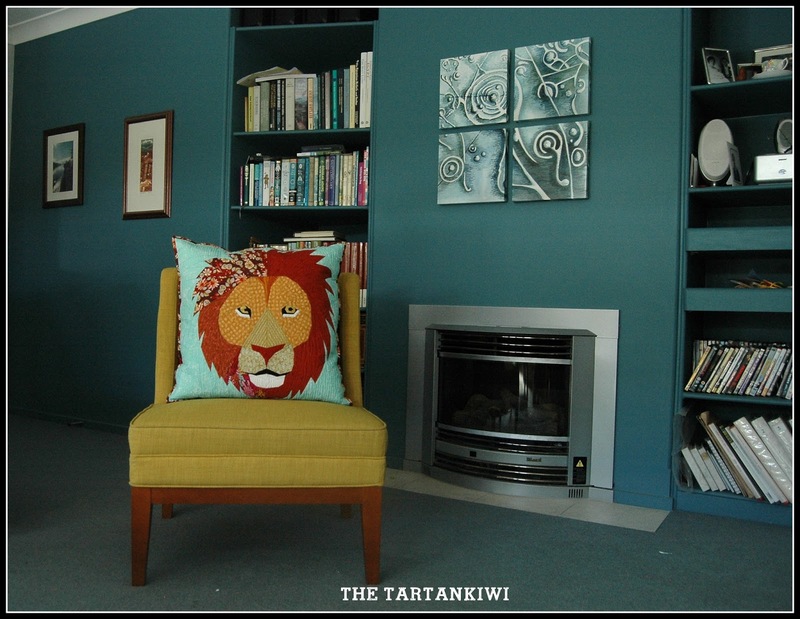 Mr Tartankiwi is convinced that the lion is my best pattern yet. He can be a pretty tough critic at times, so believe me, this is high praise! 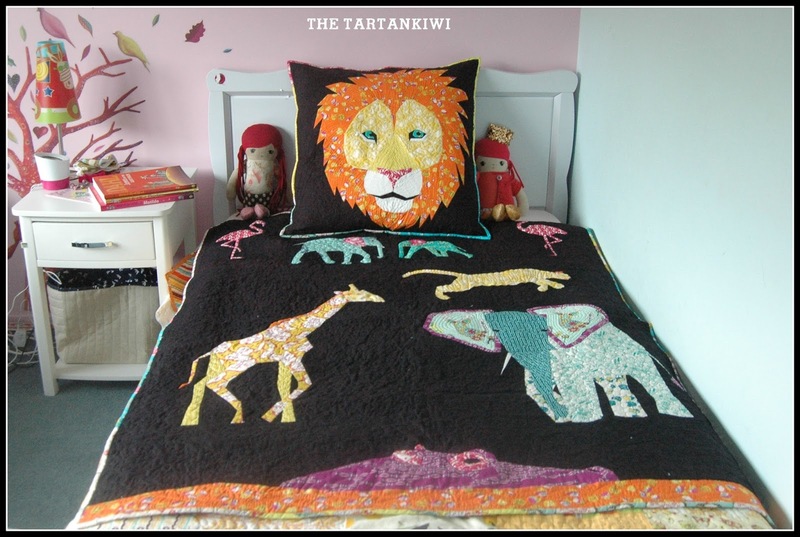 The only problem is that Mr Tartankiwi has now requested a 24 inch tiger cushion and my daughter wants a 24 inch horse cushion- ah my work is never done! I guess I had better get designing and sewing. No rest for the wicked eh!?! Wee Man looks like he loves his new cushion. I think the colour of the nose is perfect - a pink one would have looked funny with the colours in the mane. Can I be a bit cheeky and add my vote for a tiger block? You are such an artist in your quilting. I adore your Marsala Lion. 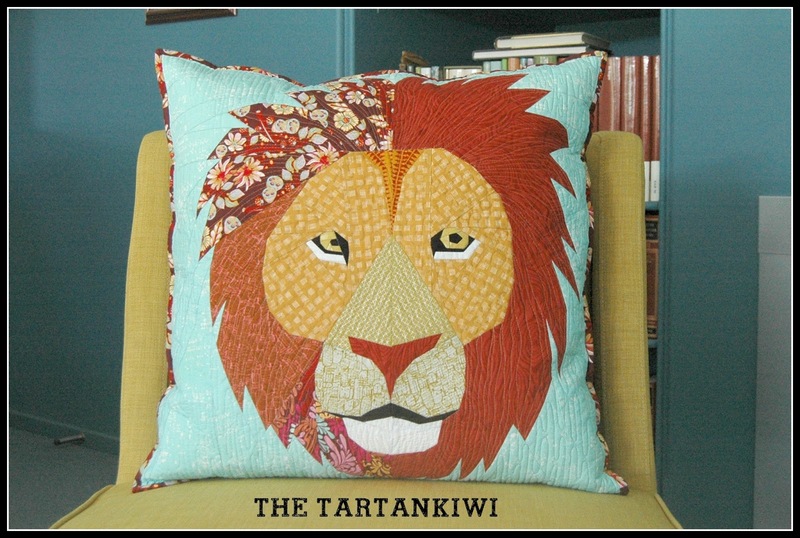 Love your Lion pillow...the colors are just beautiful and you made me look up the word, marsala to see exactly what it was. Always willing to learn something new from my favorite subject...foundation piecing. I also made your hippo today and think it will look beautiful with all of my waterlife critters in our son's daughter's baby quilt when she arrives any time. Thanks for sharing your talents. Awesomeness! 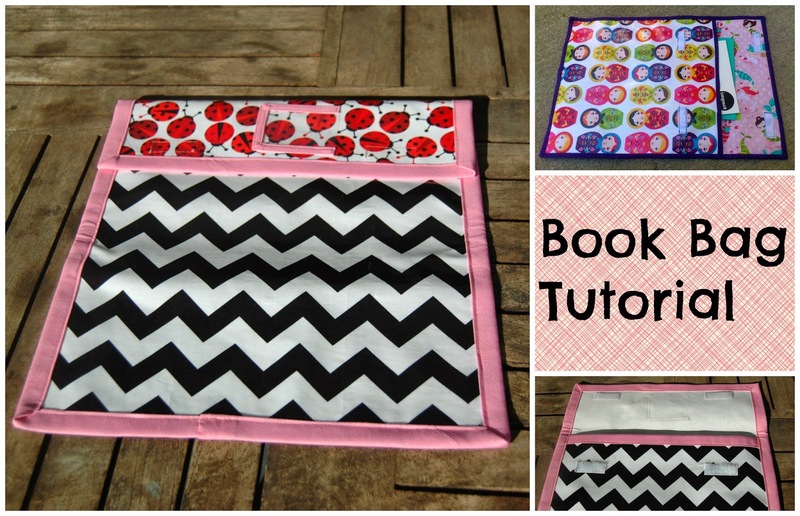 Such a strong design and your quilting is perfect! I can see why the wee fellar likes it so! I love lions and yours is suitably impressive! You chose the fabrics and their placements really well. Great job! This pattern really is super Juliet and you have done an amazing job ! This is so fabulous. At PMQG Sew Day, the gals were all gagling over your patterns and I commented that you were doing the Pantone Challenge and no one believed me. HA! 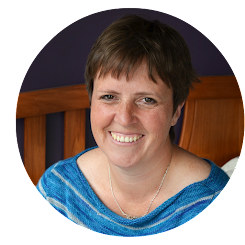 Your pillow is outstanding as are the fabrics and the binding just tops it! Way to go. Gorgeous work Juliet - mmmm you got skills lady! !